"... the interconnection must be configured and verified individually with each of the hundreds of companies that use it. In the interest of efficiency, we have chosen to prioritize the companies most used by our customers..."
could we have a continuously updated list of those companies and their status, probably best published in the status page? Moreover, could we have on the same page a continuously updated status of all the other issues which are now and it'll continue to be part of the "continuous and progressive work" at Fizz? Good suggestion. Thx for the link - I just used it. At this exact time I'm stuck on the 2-step auth with Fiverr. Well then, after reading this along with other messages the team had said, I can say that I definitely see alot more potential in Fizz actually succeeding, originally (not to be rude to the Fizz team) but I didn't see them really putting any effort on attempting to make their services succeed, mainly due to the fact that they aren't really informing us about their roadmap and how they plan to complete it, would be really nice if they could add on that status page when they are working on fixing stuff, just to help us out to know whats going on since there have been alot of people who have lost faith and left Fizz. I really wish to see Fizz succeed in becoming the top prepaid mobile provider. Whizz and the others, keep on doing your magic, any and all progress that you do will increase popularity. It would be nice if they could even knock off say a dollar just for all the bugs we are experiencing since I was paying the same with my old provider but they were already configured and working from the get-go and I'm sure alot of the others would agree. I get that they may need funding for paying all the staff, but if they just think of businesses how they work, you gotta give money to make money. (This wasn't necessarily targeted for you Robert, but I have a good feeling that the team will be reading your post and hopefully see this comment). Adding insult to injury, can't even received the automated phone call from Paypal to confirm identity. Call is received but immediately hangs up. I resonate with you Sebastien G., receiving Paypal authentication alerts has been a real sore point. Not only are we not able to receive the SMS, we can't even receive phone calls from Paypal. I have the same issue where the call comes and after one ring, goes straight to voicemail. For now, I have changed my phone number in Paypal, to my friend's number so he can authenticate on my behalf, which is something I shouldn't have to do. Furthermore, I really think Fizz/Whizz should be more active on the community forums and providing us regular updates on each and every issue. Especially since they don't have a customer center where customers can call. All they have is this forum, and the chat bubble which occasionally works. On FB Messenger they take up 2 days to respond to any queries. Every child company I know(Fido, Koodo, Virgin), they all have a customer support center where you can call in. 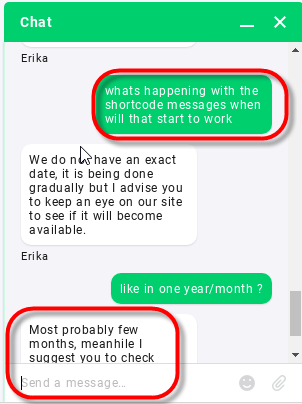 So if they are going to skim out on phone customer support, then they should be providing us with real time support online, whether it be on the forums or chat or FB messenger. The only thing working with PayPal is answering two of the secret questions, if you have them. This is what I use since this problem occurred. You seem to be unable to receive the verification code. There might be a problem with your network connectivity"
But you guys dont have a number to call.. frustrating. How do you unblock them? pls help. So, dear Fizz, do you think all these customers and the time and effort they put to explain in detail their issues worth some attention and few consistent words from you? School bus cancellation alerts via SMS not working either in Ottawa. Seriously, Fizz? Can't verify my CC to add it to my Apple Wallet. Please keep working on it. It's not a dealbreaker for me but it is annoying. Oh, thank you so much, dear Fizz, it looks they finally "answered" me, I start missing regular SMS. the featured SMS thread is closed again! Hello, I try to recover my password from ADP to get my payrolls and T1/R4 but I can never receive the SMS. SMS is the only recovery option since I am not working at my previous company anymore so they deleted my email account. +1 for the status page showing the progress on the most common problems. List of ALL Fizz major PROBLEMS and ETA REQUEST from Fizz?